Select the categories that match your business. The Trenton Chamber of Commerce uses PayPal to collect your registration fee. Please click on the "PayPal - Click Here To Pay" button below, it will take you to the PayPal site for payment. If you do not have a PayPal account you can click on the "PayPal" button below and you can pay securely using your credit card. CAMV is an association of independent chambers that meet monthly for information sharing, mutual support, advocacy, education, and joint planning. 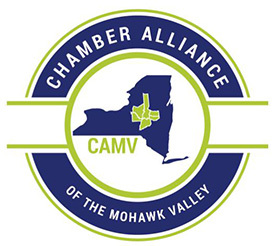 Chambers of Commerce from Boonville, Camden, Clinton, Greater Oneida area, Herkimer County, Kuyahoora Valley, Marcy, New Hartford, Rome, and Trenton are members. 10 Chambers from three counties: Oneida, Herkimer and Madison! The Genesis Group is a vibrant association working to advance regional economic, social and cultural interest and to foster regional unity and cooperation. Located in the heart of New York State, Oneida County is home to exciting attractions, delightful accommodations, world-class museums, and bountiful shopping opportunities.